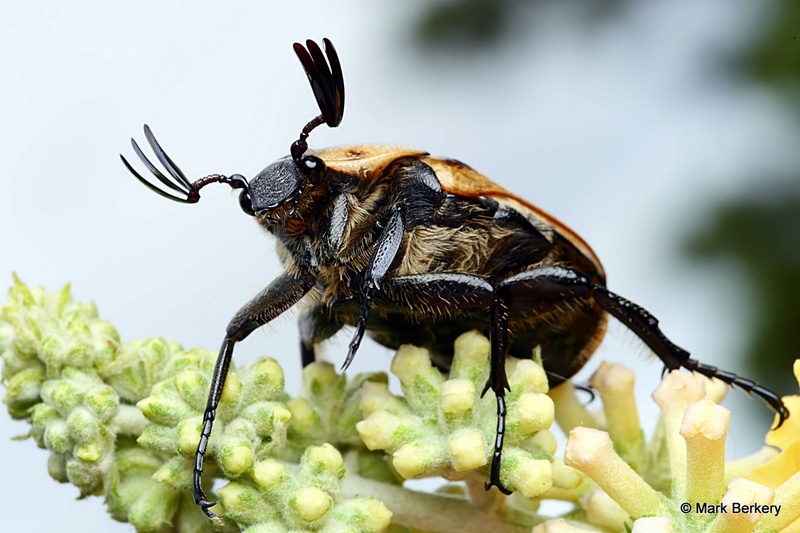 This beetle has a lot of personality… quite an inquisitive look. And I love how hairy it is underneath, almost cuddly. Wow, what a handsome creature! All we have here with antlers are the dumb ol’ deer. :) Great shots, Mark! That’s a Buddleia flower spike your beetle is on. Interesting. Were they after some nectar do you think? Not entirely sure what beetles eat or if they bother eating anything in their short (?) lives, mating being the main objective. Yes, it is Lissa. They feed and mate on the flowers, like old hippies – where the hippies got it from. 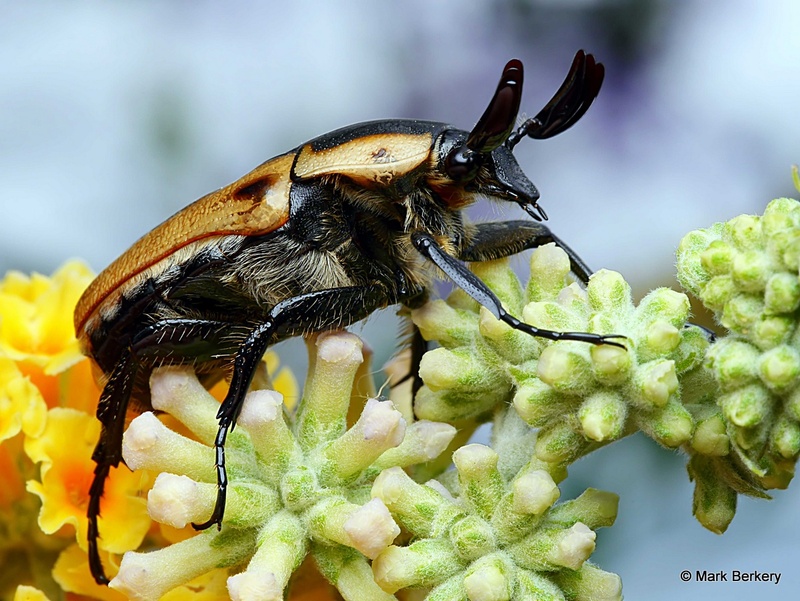 I’ve seen beetles eat all sorts, fruit and nectar is what I would provide them. It doesn’t take long for the Buddleias to set down roots and start up. I got a few more for pots – can move them from the heat of summer if need be, the really dark purple one that was so loved early on by so many natives. A fantastic insect and photos to match. Love the second shot, Mark. Can’t tell if it’s curious or pissed off, but that one has plenty of options for captions. Thanks Steve. I think it may have been just full of beans, mating time – you know … :-) It may just have been at the end of the flower spike and needing to turn, they are awkward to move in small spaces. And sometimes they won’t move for their life, at others they won’t keep still. That first shot is amazing. Lovely, thanks. 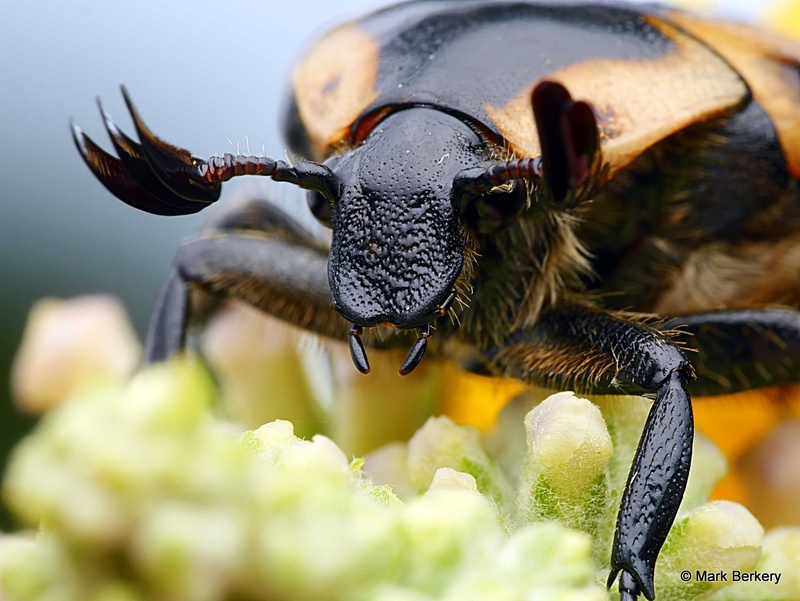 What a wonderful beetle! Great shots!! !